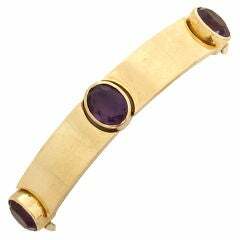 Danish modern 14k gold linked bracelet with six square, high domed amethyst stones created by Bent Knudsen of Denmark. 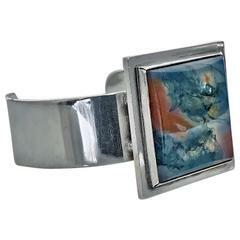 Bracelet measures 6.5" in length by .75" wide and is signed Bent K, Denmark, 585. In very good vintage condition showing natural inclusions and minor micro chips to two stones on the facets. 49.6 grams. Very good vintage condition showing minor wear commensurate with age. Bent Knudsen Sterling Silver Bracelet #2. Consists of 8 links. Measures 19 cm / 7 31/64 in. Weighs 73 g / 3.15 oz. 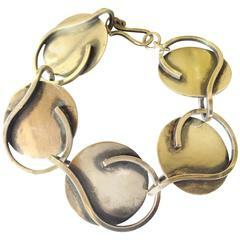 Bent Knudsen Sterling Silver Bracelet. Measures 17.8 cm / 7 1/64 in. Weighs 21.5 g / 0.76 oz. Is in good condition. 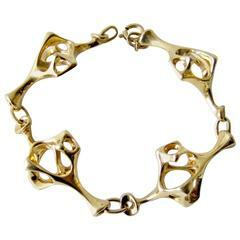 Bent Knudsen Sterling Silver Sharkfin Bracelet. 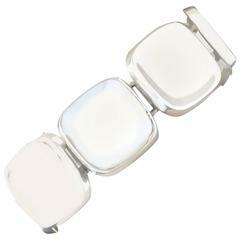 Measures 17 cm long and 1.5 cm wide / 6 11/16 in x 0 19/32 in. Weighs 27 g / 0.95 oz. 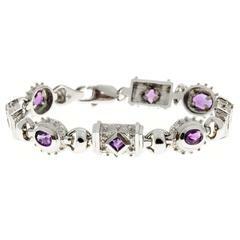 Bent Knudsen Sterling Silver Bracelet #326. Measures 18 cm / 7 3/32 in. length, 2.9 cm / 1 9/64 in. width. Weighs 64 g / 2.25 oz. Is in perfect condition.